Bhubezi the team from Esitjeni Primary in Lobamba received their Swazi international passports and UK visa's today. SRU Head of Coach & Development, Michael Dos Santos said "With all the paperwork out of the way, we can now fully concentrate on getting the team prepared for the Touraid Festival of Rugby. We wouldlike to thank everyone at the Ministry of Sport and Home Affairs for their help and assistance in getting the passports"
Bhubezi with their new kitBhubezi, the Esitjeni Primary School team received kit today donated by the SKRUM Programme. The players received jerseys and shorts all branded with the Bhubezu logo. 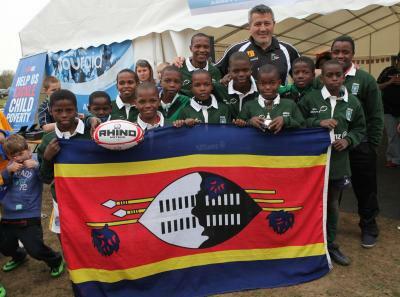 The Little Rhino's with All Black legend Zinzan Brooke at the end of the Abbey Touraid 7's tournamentThe Little Rhino's returned home today from the UK after participating in the Abbey Touraid U/13's 7's rugby tournament. The local team came sixth out of sixteen teams. The Little Rhino'sToday saw the Little Rhino's leave for the United Kingdom where they will be participating in the Abbey Touraid U/13's 7's Rugby Tournament. The tournament will be played in Reading at the Abbey Reading Rugby Club on Sunday. 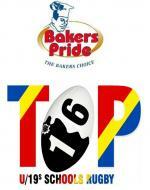 .Following a meeting held in Manzini at the Charitas Centre with the coaches from the sixteen schools participating in the Bakers Pride TOP16 U/19's Inter Schools 7's Tournament the draw for the four pools took place.